I think it is important after successes such as the constitutional referendum in Kenya for the international community and especially the US to get behind African youth. They need the support of the international community both in word and action to affect the positive change they desire. Please go to the USAID Yes! 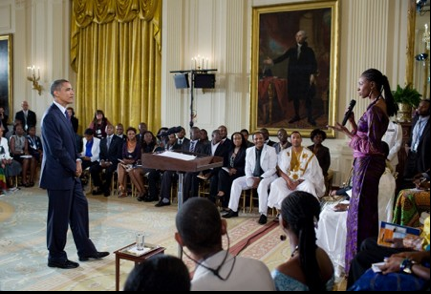 Youth Can initiative to learn more about how the US is supporting Kenyan youth. Click to read the transcript from Obama’s address. THE PRESIDENT: Thank you. Thank you. (Applause.) Thank you, everybody, please have a seat. Have a seat. It’s my great privilege to welcome all of you to this Young African Leaders Forum. You’ve joined us from nearly 50 countries. You reflect the extraordinary history and diversity of the continent. You’ve already distinguished yourselves as leaders —- in civil society and development and business and faith communities —- and you’ve got an extraordinary future before you. In fact, you represent the Africa that so often is overlooked — the great progress that many Africans have achieved and the unlimited potential that you’ve got going forward into the 21st century. Now, I called this forum for a simple reason. As I said when I was in Accra last year, I don’t see Africa as a world apart; I see Africa as a fundamental part of our interconnected world. Whether it’s creating jobs in a global economy, or delivering education and health care, combating climate change, standing up to violent extremists who offer nothing but destruction, or promoting successful models of democracy and development —- for all this we have to have a strong, self-reliant and prosperous Africa. So the world needs your talents and your creativity. We need young Africans who are standing up and making things happen not only in their own countries but around the world. And the United States wants to be your partner. So I’m pleased that you’ve already heard from Secretary of State Clinton, and that we’re joined today by leaders from across my administration who are working to deepen that partnership every day. I can’t imagine a more fitting time for this gathering. This year, people in 17 nations across Sub-Saharan Africa are proudly celebrating 50 years of independence. And by any measure, 1960 was an extraordinary year. From Senegal to Gabon, from Madagascar to Nigeria, Africans rejoiced in the streets —- as foreign flags were lowered and their own were hoisted up. So in 12 remarkable months, nearly one-third of the continent achieved independence —- a burst of self-determination that came to be celebrated as “The Year of Africa” — at long last, these Africans were free to chart their own course and to shape their own destiny. Now, 1960, of course, was significant for another reason. Here in the United States of America it was the year that a candidate for president first proposed an idea for young people in our own country to devote a year or two abroad in service to the world. And that candidate was John F. Kennedy, and that idea would become the Peace Corps — one of our great partnerships with the world, including with Africa. Now, the great task of building a nation is never done. Here in America, more than two centuries since our independence, we’re still working to perfect our union. Across Africa today, there’s no denying the daily hardships that are faced by so many — the struggle to feed their children, to find work, to survive another day. And too often, that’s the Africa that the world sees. But today, you represent a different vision, a vision of Africa on the move — an Africa that’s ending old conflicts, as in Liberia, where President Sirleaf told me, today’s children have “not known a gun and not had to run”; an Africa that’s modernizing and creating opportunities — agribusiness in Tanzania, prosperity in Botswana, political progress in Ghana and Guinea; an Africa that’s pursuing a broadband revolution that could transform the daily lives of future generations. So it’s an Africa that can do great things, such as hosting the world’s largest sporting event. So we congratulate our South African friends. And while it may have been two European teams in the final match, it’s been pointed out that it was really Africa that won the World Cup. So once again, Africa finds itself at a moment of extraordinary promise. And as I said last year, while today’s challenges may lack some of the drama of 20th century liberation struggles, they ultimately may be even more meaningful, for it will be up to you, young people full of talent and imagination, to build the Africa for the next 50 years. As you work to create jobs and opportunity, America will work with you, promoting the trade and investment on which growth depends. That’s why we’re proud to be hosting the AGOA Forum this week to expand trade between our countries. And today I’ll also be meeting with trade, commerce, and agriculture ministers from across Sub-Saharan Africa. It’s also why our historic Food Security Initiative isn’t simply about delivering food; it’s about sharing new technologies to increase African productivity and self-sufficiency. Now, no one should have to pay a bribe to get a job or to get government to provide basic services. So as part of our development strategy, we’re emphasizing transparency, accountability, and a strong civil society — the kind of reform that can help unleash transformational change. So Africa’s future also belongs to those who take charge of that kind of transparency and are serious about anti-corruption measures. Africa’s future belongs to those who take charge of their health, like the HIV/AIDS counselor from Malawi who helps others by bravely sharing her own experience of being HIV-positive — that’s Tamara Banda. Where is Tamara? There she is right there. Thank you, Tamara. (Applause.) So our Global Health Initiative is not merely treating diseases; it’s strengthening prevention and Africa’s public health systems. And I want to be very clear. We’ve continued to increase funds to fight HIV/AIDS to record levels, and we’ll continue to do what it takes to save lives and invest in healthier futures. Africa’s future also belongs to societies that protects the rights of all its people, especially its women, like the journalist in Ivory Coast who has championed the rights of Muslim women and girls —- Aminata Kane-Kone. Where is Aminata? There she is right there. (Applause.) To you and to people across Africa, know that the United States of America will stand with you as you seek justice and progress and human rights and dignity of all people. Now, this is a forum, so we’ve devoted some time where I can answer some questions. I don’t want to do all the talking. I want to hear from you about your goals and how we can partner more effectively to help you reach them. And we want this to be the beginning of a new partnership and create networks that will promote opportunities for years to come. But I do want to leave you with this. You are the heirs of the independence generation that we celebrate this year. Because of their sacrifice, you were born in independent African states. And just as the achievements of the last 50 years inspire you, the work you do today will inspire future generations. So each of you are here today because you are a leader. You’ve inspired other young people in your home countries; you’ve inspired us here in the United States. The future is what you make it. And so if you keep dreaming and keep working and keep learning and don’t give up, then I’m confident that your countries and the entire continent and the entire world will be better for it. All right, with that, I’m going to take questions. Now, here are the rules — (laughter.) People, everybody who has a question, they can raise their hand. In order to be fair, I’m going to call girl, boy, girl, boy. We’re going to alternate. And try to keep your question relatively short; I’ll try to keep my answer relatively short, so I can answer as many questions as possible, because we have a limited amount of time. Okay? THE PRESIDENT: That’s fine. Somebody will translate for me? Yes? Go ahead. Just make sure that you stop after each sentence, because otherwise she will forget what you had to say. Q Thank you very much. (Speaks in French and is translated.) Mr. President, hello. And hello, everybody. I’m Fatima Sungo (phonetic) of Mali. I do have a question for you and I look forward to getting your answer. But before I do so, I’d like to begin by telling you, Mr. President, how truly honored and privileged we feel to be with you today, and how privileged we are to express the voices of African youth, of African young leaders, and of course fully appreciate your recognizing us and giving us the opportunity to be here, and also recognizing our own responsibility to take your voice back home. I’d like to say that I’m convinced this is an important watershed moment, this is the beginning of important change, the wonderful initiative you had to call us all here. I wonder when did you see that particular light? When did you imagine that bringing us here would be such a good idea? I’m wondering what your thought process was, Mr. President. THE PRESIDENT: Well, first of all, one of the things that happens when you’re President is that other people have good ideas and then you take credit for them. (Laughter.) So I want to make sure that I don’t take credit for my ideas — for these ideas — because the truth is my staff works so hard in trying to find new ways that we can communicate not just to the heads of state, but also at the grassroots. And the reason, I think, is because when you think about Africa, Africa is the youngest continent. Many of the countries that you represent, half of the people are under 30. And oftentimes if all you’re doing is talking to old people like me, then you’re not reaching the people who are going to be providing the energy, the new initiatives, the new ideas. And so we thought that it would be very important for us to have an opportunity to bring the next generation of leaders together. That’s point number one. Point number two — and I’m going to be blunt occasionally during this forum, so I hope you don’t mind — sometimes the older leaders get into old habits, and those old habits are hard to break. And so part of what we wanted to do was to communicate directly to people who may not assume that the old ways of doing business are the ways that Africa has to do business. So in some of your countries, freedom of the press is still restricted. There’s no reason why that has to be the case. There’s nothing inevitable about that. And young people are more prone to ask questions, why shouldn’t we have a free press? In some of your countries, the problem of corruption is chronic. And so people who have been doing business in your country for 20, 30 years, they’ll just throw up their hands and they’ll say, ah, that’s the way it is. But Robert Kennedy had a wonderful saying, where he said, some people see things and ask why, and others see things that need changing and ask, why not. And so I think that your generation is poised to ask those questions, “Why not?” Why shouldn’t Africa be self-sustaining agriculturally? There’s enough arable land that if we restructure how agriculture and markets work in Africa, not only could most countries in Africa feed themselves, but they could export those crops to help feed the world. Why not? New infrastructure — it used to be that you had to have telephone lines and very capital intensive in order to communicate. Now we have the Internet and broadband and cell phones, so you — the entire continent may be able to leapfrog some other places that were more highly developed and actually reach into the future of communications in ways that we can’t even imagine yet. Why not? So that’s the purpose of this. I also want to make sure that all of you are having an opportunity to meet each other, because you can reinforce each other as you are struggling and fighting in your own countries for a better future. You will now have a network of people that help to reinforce what it is that you’re trying to do. And you know that sometimes change makes you feel lonely. Now you’ve got a group of people who can help reinforce what you’re doing. Okay. It’s a gentleman’s turn. This is why there are leaders, everybody has something to say. But you don’t have to snap. No, no, no. It’s a guy’s turn — this gentleman right here. Q Mr. President, my name is Bai Best (phonetic) from Liberia. The late Dr. Solomon Carter Fuller was the first black — the first black psychiatrist in America and probably in the world. In my country in Liberia, where there are a lot of great people who make landmark accomplishments both in their nation and in the world, many of them are not recognized for their accomplishments. Today, Dr. Fuller’s name is etched where there is a medical — there is a psychiatric center named in his honor at a place in Boston. There are many other young African and young Liberian talented people who have great ideas and who want to come back home and contribute to their countries, to the development of their peoples. But many times, their efforts — their patriotic efforts — are stifled by corrupt or sometimes jealous officials in government and in other sectors. It’s an age-old problem. Many times, they want to seek — that basically leads them to seek greener pastures and better appreciation abroad instead of coming back home. What are your thoughts on this? THE PRESIDENT: Well, look, this is a problem that’s not unique to Africa. Given different stages of development around the world, one of the problems that poorer countries often have is that the best educated and the most talented have opportunities elsewhere. And so there’s what’s called the “brain drain” — people saying, I can make 10 times as much money if I’m a doctor in London as I can if I’m a doctor back home. And so this is a historic problem. Here is the interesting moment that we’re in, though — if you look at where the greatest opportunities are, they’re actually now in emerging markets. There are countries in Africa that are growing 7, 8, 9 percent a year. So if you’re an entrepreneur now with an idea, you may be able to grow faster and achieve more back home that you could here. Now, it entails greater risk, so it may be safer to emigrate. But it may be that you can actually achieve more, more quickly back home. And so the question is for young leaders like yourselves, where do you want to have the most impact? And you’re probably going to have more impact at home whether you’re a businessman or woman, or you are a doctor or you are an attorney, or you are an organizer. That’s probably going to be the place where you can make the biggest change. Now, you’re absolutely right, though, that the conditions back home have to be right where you can achieve these things. So if you want to go back home and start a business, and it turns out that you have to pay too many bribes to just get the business started, at some point you may just give up. And that’s why one of the things that we’re trying to do — working with my team — when we emphasize development, good governance is at the center of development. It’s not separate. Sometimes people think, well, that’s a political issue and then there’s an economic issue. No. If you have a situation where you can’t start a business or people don’t want to invest because there’s not a clear sense of rule of law, that is going to stifle development. If farmers have so many middlemen to get their crops to market that they’re making pennies when ultimately their crops are being sold for $10, over time that stifles agricultural development in a country. So what we want to do is make sure that in our interactions with your governments, we are constantly emphasizing this issue of good governance because I have confidence that you’ll be able to figure out what changes need to be made in your country. I’ve always said the destiny of Africa is going to be determined by Africans. It’s not going to be determined by me. It’s not going to be determined by people outside of the continent. It’s going to be determined by you. All we can do is make sure that your voices are heard and you’re able to rise up and take hold of these opportunities. If you do that, I think that there are going to be a lot of people who — even if they’re educated abroad — want to come home to make their mark. All right. Let’s see, I’m going to call on this young lady right here. Q (Speaks in Portuguese and is translated.) Good afternoon, everyone. And thank you, Mr. President, for this opportunity. Q It is, indeed, from Mozambique, sir. Q Knowing, Mr. President, that, of course, America is a reference point for democracy in the world, and that you, sir, are, indeed a protagonist in that context today, I would love to hear from you, sir, what you would recommend to the young people in Africa and to civil society, in particular, in terms of following principles of nonviolence and good governance and democratic principles in our country. Because, of course, our reality is very often quite starkly different. There are 80 percent abstentionism often in elections, and elections that, indeed, lack transparency. And all too often lead, alas, to social conflict. Thank you. THE PRESIDENT: Well, let me say, first of all, that if you are — just as I said that you can’t separate politics from economics, you can’t separate conflict from development. So the constant conflict, often ethnically-based conflict, that has taken place in Africa is a profound detriment to development and it’s self-reinforcing. If you have conflict and violence, that scares off investors. That makes it more difficult for business people to create opportunities, which means that young people then don’t have work, which means that they are more prone to be recruited in violent conflicts. And you can get a vicious cycle. So I am a profound believer in not looking at violence as a solution to problems. And I think the moral and ethical power that comes with nonviolence when properly mobilized is profound. Number two, I think the most important thing that maybe young people here can do is to promote the values of openness, transparency, honest debate, civil disagreements within your own groups and your own organizations, because that forms good habits. If you are part of an organization — and I’m going to speak to the men here, in particular — if you are part of an organization where you profess democracy but women don’t have an equal voice in your organization, then you’re a hypocrite, right? And that is something that — (applause.) And that is something that we have to be honest about. Oftentimes, women are not getting the same voice in African countries, despite the fact that they are carrying more than their fair share of burdens. So within your own organizations, within your own networks, modeling good democratic practices, listening to people who you disagree with respectfully, making sure that everybody gets a seat at the table — all those things I think are very important. Because part of what I’m going to — what I’m hoping for is that some of you will end up being leaders of your country some day. And if you think about it, back in the 1960s, when all these — your grandparents, great-grandparents were obtaining independence, fighting for independence, the first leaders, they all said they were for democracy. And then what ends up happening is you’ve been in power for a while and you say, well, I must be such a good ruler that it is for the benefit of the people that I need to stay here. And so then you start changing the laws, or you start intimidating and jailing opponents. And pretty soon, young people just like yourself — full of hope and promise — end up becoming exactly what they fought against. So one of the things that I think everybody here has to really internalize is the notion that — I think it was Gandhi who once said you have to be the change that you seek. You have to be the change that you seek. And one of the wonderful things about the United States is that in my position as President there oftentimes where I get frustrated, I think I know more than some of my critics. And yet, we have institutionalized the notion that those critics have every right to criticize me, no matter how unreasonable I think they may be. And I have to stand before the people for an election, and I’m limited to two terms — it doesn’t matter how good a job I do. And that’s good, because what that means is that we’ve got to — we’ve instituted a culture where the institutions of democracy are more important than any one individual. And, now, it’s not as if we’re perfect. Obviously, we’ve got all kinds of problems as well. But what it does mean is that the peaceful transfer of power and the notion that people always have a voice — our trust in that democratic process is one that has to be embraced in all your countries as well. Okay? All right, it’s a gentleman’s turn. Let me try to get this side of the table here. This gentleman right here. I’m not going to get everybody, so I apologize in advance. Q Thank you very much, Mr. President. I’m from Malawi. Mr. President, HIV/AIDS is greatly affecting development in Africa. And if this continues, I’m afraid I think Africa has no future. And I think the young people like us must bring change. And we really need a strong HIV prevention program. But, again, access to treatment must be there. I attended the recent World AIDS Conference in Vienna, and the critics were saying that the worst — the U.S. government is not supporting enough HIV/AIDS work in Africa through the PEPFAR and the Global Fund. But, again, on the other side, other HIV/AIDS activists are saying that Africa on its own has not mobilized enough resources to fight the HIV/AIDS pandemic and they are largely depending on the West. I think the challenge for us as African young leaders is to make sure that this comes to an end and we really need to reduce the transmission. I don’t know — from your perspective, what can we do to make sure that this comes to a stop? Otherwise, it’s greatly affecting development in Africa. THE PRESIDENT: Good. Well, let me start by just talking about the United States and what we’re doing. I had some disagreements with my predecessor, but one of the outstanding things that President Bush did was to initiate the PEPFAR program. It’s a huge investment in battling HIV/AIDS both with respect to prevention and also with respect to treatment. Billions of dollars were committed. We have built off of that. So when you hear critics — what the critics are saying is that although I’ve increased the funding of the PEPFAR program, they would like to see it increased even more, which I’m sympathetic to, given the fact that the need is so great. But understand I’ve increased it; I haven’t decreased it — at a time when the United States is suffering from the worst economic — just coming out of the worst economic recession that we’ve seen since the 1930s. Nevertheless, because of our commitment to this issue, we’ve actually increased funding. Now, we have couched it in a broader initiative we call the Global Health Initiative. Because even as we’re battling HIV/AIDS, we want to make sure that we are thinking not only in terms of treatment, but also in terms of prevention and preventing transmission. We’re never going to have enough money to simply treat people who are constantly getting infected. We’ve got to have a mechanism to stop the transmission rate. And so one of the things we’re trying to do is to build greater public health infrastructure, find what prevention programs are working, how can we institutionalize them, make them culturally specific — because not every program is going to be appropriate for every country. I will say that in Africa, in particular, one thing we do know is that empowering women is going to be critical to reducing the transmission rate. We do know that. Because so often women, not having any control over sexual practices and their own body, end up having extremely high transmission rates. So the bottom line is we’re going to focus on prevention, building a public health infrastructure. We’re still going to be funding, at very high levels, antiviral drugs. But keep in mind, we will never have enough money — it will be endless, an endless effort if the transmission rates stay high and we’re just trying to treat people after their sick. It’s the classic story of a group of people come upon all these bodies in a stream. And everybody jumps in and starts pulling bodies out, but one wise person goes downstream to see what’s exactly happening that’s causing all these people to drown or fall in the water. And that’s I think what we have to do, is go downstream to see how can we reduce these transmission rates overall. And obviously — when I visited Kenya, for example — just in terms of education — Michelle and I, we both got tested near the village where my father was born. We got publicly tested so that we would know what our status was. That was just one example of the kinds of educational mechanisms that we can use that hopefully can make some difference. All right? Okay, it’s a woman’s turn. Okay, this one right here. Q Thank you, very much, Mr. President. And greetings from Ghana. We are looking forward fervently to 2014 — (laughter) — for a repeat. And I recollect that I was hosting a radio program the day of the match. And we have a football pundit in Ghana — he doesn’t speak English quite well, but very passionate. And so I was interviewing him about what the psyche of our boys should be ahead of the match. And he said to me, “This is not war, it is football. If it were to be war, then maybe we should be afraid because the might of America is more than us.” (Laughter.) This is football. They should go out there and be the best that they could be. And they did. THE PRESIDENT: Well, they did an excellent job. They were a great team. Q Mr. President, my question now is that I hear a lot of young African leaders wonder how committed America would be to a partnership. I hear those who are cynical about the notion of partnership. They ask — and always they ask, partnership? What kind of fair partnership can exist between a strong and a weak nation? And so as we prepare ourselves for the future, we ask the same question of America: How committed is your country to ensuring that the difficult decisions that young people have to make about trade, about agriculture, about support, are made — to the extent that they may not be in the interest of America? Because they tell me also that America will protect its interest over and above all else. Is America committed to ensuring a partnership that might not necessarily be beneficial to America, but truly beneficial to the sovereign interest of the countries that we represent? Now, I actually think, though, that the interests of the United States and the interests of the continent of Africa greatly overlap. We have a huge interest in seeing development throughout Africa — because we are a more mature economy, Africa is a young and growing economy, and if you can buy more iPods and buy more products and buy more services and buy more tractors from us, that we can sell to a fast-growing continent, that creates jobs here in the United States of America. We have a huge interest in your public health systems because if we’re reducing greatly HIV/AIDS transmissions in Africa, then that will have a positive effect on HIV rates internationally, because of the transmigration of diseases back and forth in an international world. And not to mention, if I’m not spending all this money on PEPFAR, that’s money I can spend somewhere else. So I’m going to be incentivized to see Africa do well. That’s in our interest. And the truth of the matter is, is that whereas with some regions of the world, we do have some genuine conflicts of interest — let’s say on trade, for example — the truth is that the United States, we don’t have huge conflicts when it comes to trade because, frankly, the trade between the United States and Africa is so small, so modest, that very few U.S. companies, U.S. commercial interests are impacted. That’s why AGOA, our trade arrangement with Africa — we can eliminate tariffs and subsidies and allow all sorts of goods to come in partly because you are not our primary competition. Now, I don’t want to pretend that there aren’t ever going to be conflicts. There will be. There’s going to be difference in world views. There are going to be some agricultural products where there are certain interests in the United States or there are certain interests in Europe that want to prevent those from coming in, even though, in the aggregate, it would not have a huge impact on the U.S. economy. And so there are going to be occasional areas of tension. But overall, the reason you should have confidence that we want a partnership is because your success will enhance our position rather than reduce it. Also Africa has some of our most loyal friends. Every survey that’s taken, when you ask what continent generally has the most positive views about America, it turns out Africa generally has a positive view of America and positive experiences. So I think that you should feel confident even if I’m not President that the American people genuinely want to see Africa succeed. What the American people don’t want is to feel like their efforts at helping are wasted. So if at a time of great constraint, we are coming up with aid, those aid dollars need to go to countries that are actually using them effectively. And if they’re not using them effectively, then they should go to countries that are. And one of the things that I’ve said to my development team is I want us to have high standards in terms of performance and evaluation when we have these partnerships — because a partnership is a two-way street. It means that, on the one hand, we’re accountable to you and that we have to listen to you and make sure that any plans that we have, have developed indigenously. On the other hand, it also means you’re accountable. So you can’t just say, give me this, give me that, and then if it turns out that it’s not working well, that’s not your problem. Right? It has to be a two-way street. Okay, looks like this side has not gotten a question here. So how about this gentleman right here. Q Thank you, Mr. President — I’m from Zimbabwe. Currently our government is in a transition between the former ruling party Zanu PF and the Movement for Democratic Change. And within this same context, Zimbabwe is currently under restrictive measures, especially for those who are party in line with Robert Mugabe under the ZIDERA Act. How has been the success of ZIDERA — the formation of the inclusive government? Because in Zimbabwe, Robert Mugabe is still using the rhetoric of sanctions, racist, property rights abuse, human rights abuse, in violation to the rule of law. How has been the success of that towards the implementation — the success or the growth of young people? THE PRESIDENT: Well, you probably have a better answer than me. So you should be sharing with our team what you think would make the most sense. I’ll be honest with you — I’m heartbroken when I see what’s happened in Zimbabwe. I think Mugabe is an example of a leader who came in as a liberation fighter and — I’m just going to be very blunt — I do not see him serving his people well. And the abuses, the human rights abuses, the violence that’s been perpetrated against opposition leaders I think is terrible. Now, Changerai has tried to work — despite the fact that he himself has been beaten and imprisoned, he has now tried to work to see if there is a gradual transition that might take place. But so far, the results have not been what we had hoped. And this always poses a difficult question for U.S. foreign policy because, on the one hand, we don’t want to punish the people for the abuses of a leader; on the other hand, we have very little leverage other than saying, if there are just systematic abuses by a government, we are not going to deal with them commercially, we’re not going to deal with them politically, in ways that we would with countries that are observing basic human rights principles. And so there have been discussions when I’ve traveled with leaders in the Southern African region about whether or not sanctions against Zimbabwe are or are not counterproductive. I will tell you I would love nothing more than to be able to open up greater diplomatic relationships and economic and commercial relationships with Zimbabwe. But in order to do so, we’ve got to see some signal that it will not simply entrench the same past abuses but rather will move us in a new direction that actually helps the people. And Zimbabwe is a classic example of a country that should be the breadbasket for an entire region. It’s a spectacular country. Now, it had to undergo a transition from white minority rule that was very painful and very difficult. But they have chosen a path that’s different than the path that South Africa chose. South Africa has its problems, but from what everybody could see during the World Cup, the potential for moving that country forward as a multiracial, African democracy that can succeed on the world stage, that’s a model that so far at least Zimbabwe has not followed. And that’s where I’d like to see it go. All right? How much more time do I have, guys? Last question? I’m sorry — last question. Last question. No, it’s a young lady’s turn. This one right here. Q Good afternoon, Mr. President, your excellencies. I am from Somalia. I came all the way here with one question, and that is, living in conflict in a country that has confused the whole world, and being part of the diaspora that went back to risk our lives in order to make Somalia a better place, especially with what we’re going through right now — how much support do we expect from the U.S.? And not support just in terms of financially or aid, but support as an ear, as a friend, as somebody who hears and listens to those of us who are putting our lives and our families at risk to defend humanity. THE PRESIDENT: Well, I think you will have enormous support from the people of the United States when it comes to trying to create a structure and framework in Somalia that works for the Somali people. Now, the history of Somalia over the last 20 years has been equally heartbreaking, if not more so. You have not had a effective, functioning government that can provide basic services. It’s been rife with conflict. And now the entire region is threatened because of radical extremists who have taken root in Somalia, taking advantage of what they perceive to be a failing state, to use that as a base to launch attacks, most recently in Uganda. And obviously the United States expresses its deepest condolences to the lives that were lost in Kampala — at the very moment of the World Cup. And it offered two contrasting visions. You have this wonderful, joyous celebration in South Africa at the same time as you have a terrorist explosion in Kampala. So we desperately want Somalia to succeed. And this is another example of where our interests intersect. If you have extremist organizations taking root in Somalia, ultimately that can threaten the United States as well as Uganda, as well as Kenya, as well as the entire region. So right now you’ve got a transitional government that is making some efforts. I don’t think anybody expects Somalia anytime in the next few years to suddenly be transformed into a model democracy. Whatever governance structures take place in Somalia have to be aware of the tribal and traditional structures and clan structures that exist within Somalia. But certainly what we can do is create a situation where people — young people are not carrying around rifles, shooting each other on the streets. And we want to be a partner with Somalia in that effort, and we will continue to do so. And some of it is financial, some of it is developmental, some of it is being able to help basic infrastructure. In some cases, we may try to find a portion of the country that is relatively stable and start work there to create a model that the rest of the country can then look at and say, this is a different path than the one that we’re taking right now. But in the end, I think that this metaphor of the success of the World Cup and the bombing shows that each of you are going to be confronted with two paths. There’s going to be a path that takes us into a direction of more conflict, more bloodshed, less economic development, continued poverty even as the rest of the world races ahead — or there’s a vision in which people come together for the betterment and development of their own country. And for all the great promise that’s been fulfilled over the last 50 years, I want you to understand — because I think it’s important for us to be honest with ourselves — Africa has also missed huge opportunities for too long. And I’ll just give you one example. When my father traveled to the United States and got his degree in the early ’60s, the GDP of Kenya was actually on partner, maybe actually higher than the GDP of South Korea. Think about that. All right? So when I was born, Kenya per capita might have been wealthier than South Korea. Now it’s not even close. Well, that’s 50 years that was lost in terms of opportunities. When it comes to natural resources, when it comes to the talent and potential of the people, there’s no reason why Kenya shouldn’t have been on that same trajectory. And so 50 years from now, when you look back you want to make sure that the continent hasn’t missed those opportunities as well. We want to make sure of that as well. And the United States wants to listen to you and work with you. And so when you go back and you talk to your friends and you say, what was the main message the President had — we are rooting for your success, and we want to work with you to achieve that success, but ultimately success is going to be in your hands. And being a partner means that we can be there by your side, but we can’t do it for you. Okay, thank you very much, everybody. Thank you.